Back Bay Guitar Trio formed in 2002 and has performed at Dartmouth College, Longy School of Music, Berklee College of Music, St. Anselm College, University of New Hampshire, The House of Blues and at the world renowned Boston Hatch Shell. The BBGT have also been featured artists in concert series for the Boston Classical Guitar Society, the New York City Classical Guitar Society, and opened up for guitarist Al Dimeola at the Lebanon (NH) Opera House. The Back Bay Guitar Trio toured Germany in the summer of 2009 and appeared as featured artists at the Hildener Meisterkurs in Hilden and a concert sponsored by the U.S. Consulate at the Nebbiensches Gartenhaus in Frankfurt. 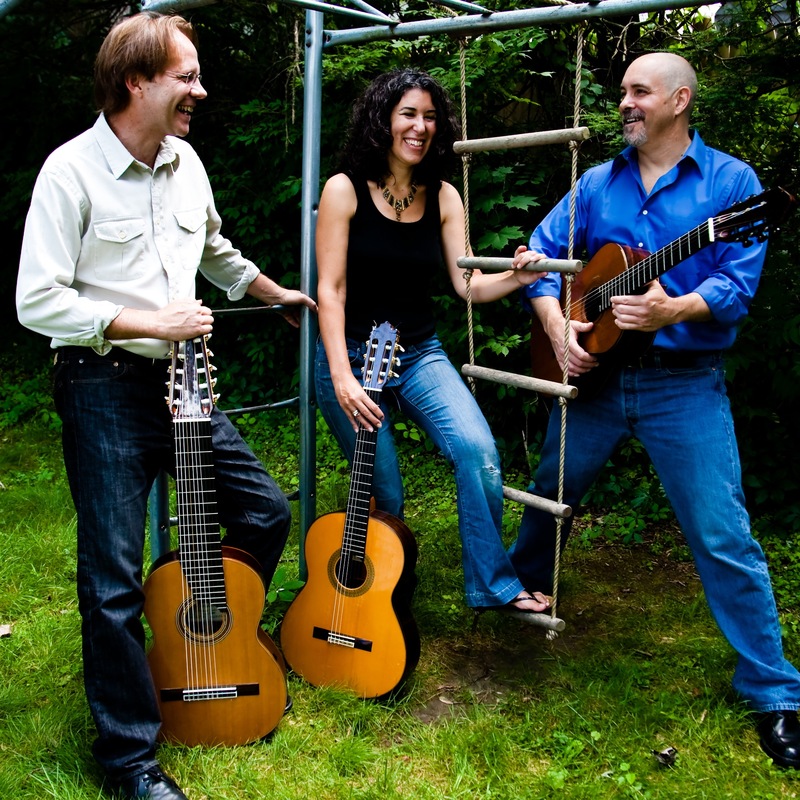 The Back Bay Guitar Trio is now booking concerts and engagements for the 2011-2012 season. David Newsam currently works as an assistant professor in the guitar department at Berklee where he has taught since 1989. He is also employed as a senior lecturer in music at Dartmouth College in Hanover, NH where he teaches guitar and jazz improvisation. David created the jazz guitar program at the University of New Hampshire where he teaches, directs the UNH Jazz Guitar Ensemble and coaches jazz ensembles. He is a former faculty member of the National Guitar Summer Workshop. David performs solo and group engagements throughout New England. He has performed in concerts and clinics with many noted musicians, among them guitarists Jim Hall, Bucky Pizzarelli, Gene Bertoncini and Howard Alden, pianists Dave McKenna and James Williams, drummers Ed Shaugnessy, Louis Bellson, Bob Moses and Alan Dawson, and jazz legends Clark Terry, Phil Wilson, Joe Williams and Milt Jackson. He has extensive theater experience including performances with Jack Jones, Mitzi Gaynor, Dianne Carroll, The Fifth Dimension, The Shirelles, and Carol Channing. Dave is the former Artistic Director of the Boston Classical Guitar Society. David is the author of the book, Making Money Teaching Music, published by Writer's Digest Books, and the DVD, How to Accelerate Your Classical Guitar Playing, produced by Rittor Music. John Mason grew up in Westwood Mass and currently resides in Northampton Mass. He studied at Middlebury College, graduating in 1984 with a bachelor's degree in music. He furthered his music education at the Berklee College of Music the following year. In 2002, he won the Guitarmageddon National Championship at the Rock and Roll Hall of Fame in Cleveland. He is currently on faculty at Westfield State College, Holyoke Community College and the Northfield Mount Hermon School. In addition to being in the Back Bay Guitar Trio, John performs with the improv group Solo Mission with drummer Gary Rzab. Sharon Wayne received her BM and MM degrees in Classical Guitar Performance from the University of Southern California where she studied with William Kanengiser and James Smith. First Prize winner of the 1991 ASTA Solo Guitar Competition, she was also a semi finalist at both the Guitar Foundation of America's International Competition in Buffalo, New York, and the Great Lakes Guitar Competition in Akron, Ohio. Ms. Wayne has played in the U.S. and Japan, and has twice been invited to perform at the Piccolo Spoleto Festival in Charleston, South Carolina. She has shared the stage with world renowned guitarists including Liona Boyd and Scott Tennant, and as a founding member of the San Francisco Guitar Quartet has been involved in the generation of new repertoire for guitar, commissioning works by Carlo Domeniconi, Eitan Steinberg, and others. Sharon appears on five CD's, including "In the Midst of Winds" (M.A.Recordings, Tokyo) with guitarist/composer Dusan Bogdanovic; "Black Opals" (SFGQ2001) with the San Francisco Guitar Quartet; and her solo CD "From the Heart," (Joplin and Sweeney) which features works by 20th Century composers. Her playing has been lauded as "spectacular" with "superbly executed style" (Charleston Post and Courier) and the San Jose Mercury News called her "one of the most appealing new classical guitarists around." Now living in New England, Sharon is the former Artistic Director of the Boston Classical Guitar Society. A former member of the guitar faculties at San Francisco Conservatory of Music and Santa Clara University, she currently serves on the faculty of the Community Music School in Springfield, MA.